Somehow time slipped away from me this past month & I didn't manage to make the butternut squash soup that was the Recipes to Rival challenge. I still wanted to make butternut squash soup but decided to doing something a little less involved than making my own broth & creme fraiche. 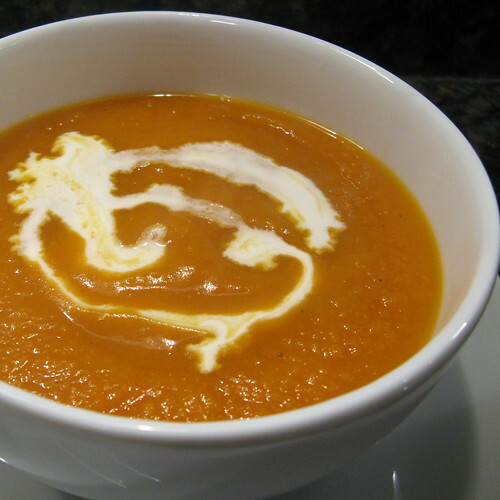 I decided to roast the squash & onion for this soup because I love the depth of flavor & richness roasting brings to vegetables, especially onions. If I had fresh garlic on hand I would have roasted a clove as well but since I didn't I used garlic powder (Its rare I don't have fresh garlic in the house but I forgot to add it to the shopping list!). I also added a little balsamic vinegar to this since I thought it would be a good counterpoint to the sweetness of the squash. A drizzle of cream over the top of each serving added just the right amount of creaminess. This soup was a real winner & I'll definitely make it again. It made a perfect dinner served with some crispy garlic bread. 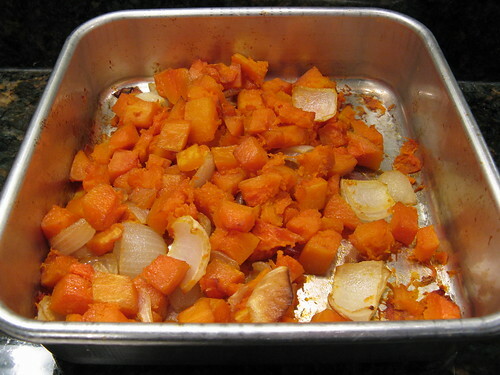 Place the butternut squash & onion in a baking dish. Pour 1 tablespoon of olive oil over the vegetables & mix to coat, add another 1/2 tablespoon if everything is not coated. Mix in 1 teaspoon balsamic vinegar. Place in oven & roast for 1 to 1 1/2 hours stirring from time to time. The squash should be very soft & the onions beginning to brown. Allow to cool. Place the roasted squash & onions in a soup pot with 2 cups of the chicken broth & use an immersion blender to process until smooth (you can also do this in a blender). Add the remaining 1 1/2 cups of chicken broth, 1/2 t balsamic vinegar & 1/2 t garlic powder to the soup. Add salt & pepper. Bring the soup to a simmer & allow to simmer uncovered for 20 minutes. Taste for seasoning & serve. Drizzle a little cream over the soup if you wish. Kat, it's gotta be one of my favourite fall/winte soups and I like it simple, maybe I'll add some ginger but I make it much like yours. This is my favorite soup! Yours looks divine! Love, love, love this soup. I only hate the peeling of the squash. I am going to try roasting the halves nest time to save my sanity!! Your soup looks great! Roasting the onions with the squash is a great idea, I'll have to do that next time I make it. This looks delicious, and the cream on top is the perfect touch. I make a very similar soup with pumpkin. November was busy for everyone I dread to think what december is going to be like. Your soup definitly captured the spirit of the challenge. looks good. This soup really does look like a winner. Great job! Roasting the butternut makes a huge difference doesn't it.Looks delicious!! Roasting is the way to go for sure! I like to add a couple of heads of garlic to the mix, partially for flavor and partially to drive the neighbors mad. I also like to drop a little curry into the soup as it really works well with squash of any sort. And thumbs up to the cream! What a great idea to roast the onion as well! Delish!